In our inaugural showing at Art Toronto, Todd Merrill Studio is exhibiting an eclectic survey of contemporary, material-driven works from nine artists. Working across such diverse mediums as painting, sculpting, and assemblage, the works shown are definitive of the 21st Century while incorporating traditional techniques and processes. Anchoring our exhibition is noted Abstract Expressionist Knox Martin. At 94, Martin’s six decade career has garnered attention from critics and collectors alike. One of the last living members of the New York School, his works have been placed in over 40 important museum collections in the US and internationally. In addition, the playful nature of Martin’s paintings has been realized into numerous large-scale mural commissions. 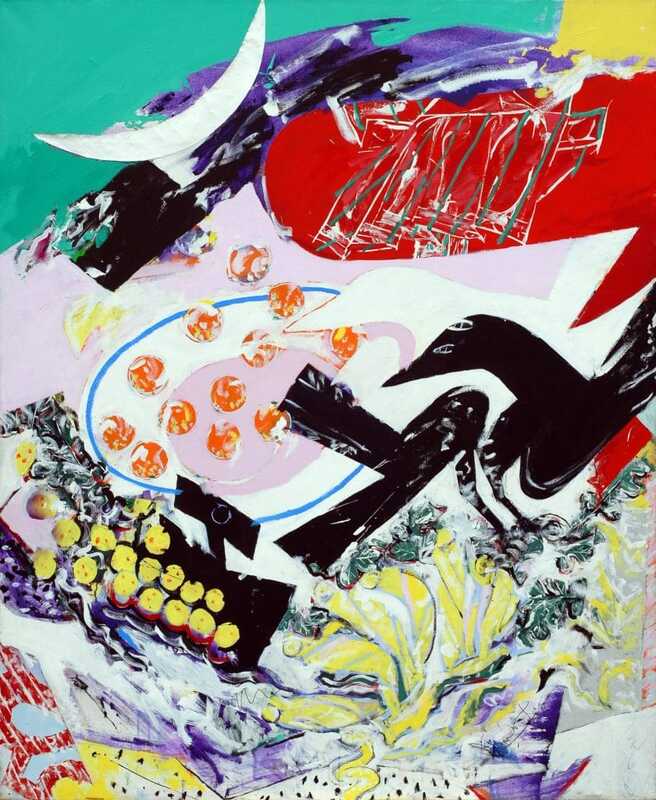 Martin’s abstract paintings are marked by impeccable draftsmanship, a unique palate and simple shapes in complex compositions. Martin’s Crow With No Mouth, 2007 possesses a complex and playful sensibility that guides the eye and the imagination. 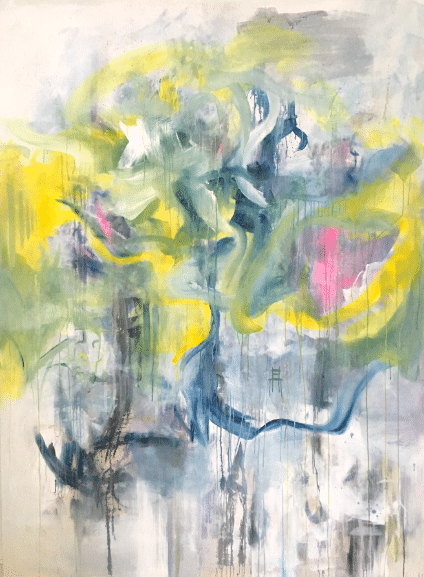 With its large, simplistic shapes, brilliant colors, free execution, and complex structure, Knox Martin’s monumental painting draws inspiration from the fifteenth-century Japanese Zen master Ikkyu Sojun’s poem, “Crow With No Mouth.” The painting suggests both the form of a bird as well as the bird’s movements but is grounded in Martin’s mastery of expressive abstraction. Art Toronto marks the first time this remarkable work will be publicly shown outside of New York City. Another contemporary painter, Maximilian Magnus, will share wall space with Martin. Both artists work within the Abstract Expressionist paradigm exploring the process of painting through movement, expression and mark making. Maximilian Magnus creates large, gestural images with a strong focus on aesthetic composition and movement. Having studied dance from a young age, Magnus uses the powerful and broad movements of his body as an expression of emotion, then transfered onto the canvas. Lyrical and diaphanous, Magnus’ paintings (as in Grateful, 2017) are deeply layered, giving the viewer a sense of looking through veils to untangle the markings beneath. In 2009 Magnus was invited as the first artist in residence at the Willem de Kooning’s Studio, where he also met and started working with Lisa de Kooning to establish the AIR program. Complementing the works on canvas, two sculptors exploring similar themes in abstraction will be on view. 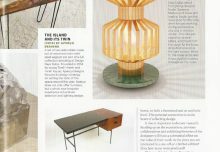 Both Niamh Barry and John Procario create unique works that bridge the gap between traditional abstract sculpture and functional design. Niamh Barry’s LED and bronze sculptures are inspired by the movement of bodies and form in space. The works assume vastly different compositions depending on the angle from which they are viewed. Elegant and captivating, Barry’s sculptures challenge the various ways we interpret negative and positive space, and the power a line can convey. Black Poise, floats effortlessly in perfect harmony of material and form. This seven foot work incorporates interlocking black patinated bronze rings with three hand-raised bronze vessels. The interiors of the vessels are finished in contrasting polished and brushed copper and illuminated by a glow of hidden LEDs. 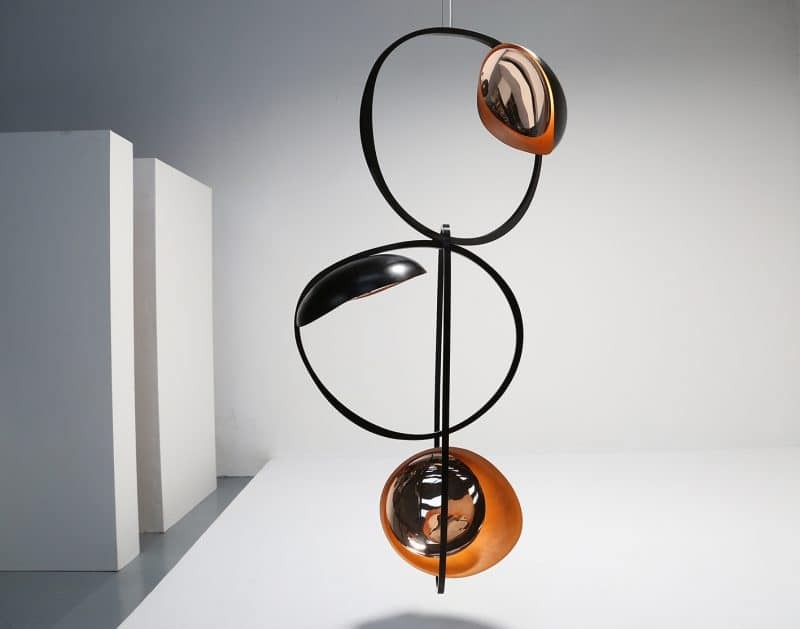 As in Barry’s celebrated earlier works, Black Poise is a feat of handcrafted metal work, perfectly illuminating Barry’s mastery of balance and movement. Since the beginning of her career with Todd Merrill Studio in 2012, Barry has risen to prominence in the art and design world, becoming one of the most sought-after figures working in LED light sculptures today. Barry has been profiled in Architectural Digest and Galerie Magazine and included in many public and private collections in the United States and abroad. Most recently, Barry was the recipient of the 2017 Award for Best Lighting in Image Interiors and Living Magazine and has been commissioned by the National Gallery of Ireland. On view for the first time in a public exhibition, Todd Merrill Studio will premier a hand-carved wood and LED sculpture by artist John Procario. Much like Niamh Barry, Procario’s works also explore the concept of a three dimensional line in space. Procario’s furniture and sculptural lighting are composed of micro-laminated, cold-pressed bent wood. He begins his process by twisting ribbons of paper to explore potential forms. However, rather than using these models to control the wood’s shape, he allows the wood to form the shape it pleases. In this way, the artistic process becomes a collaboration between the artist and the wood’s respective personalities. The outcome is an organic, fluid design balanced with a sense of motion. With Standing Freeform, 2017 John Procario continues the Freeform Series’ exploration of streamlined, undulating forms. 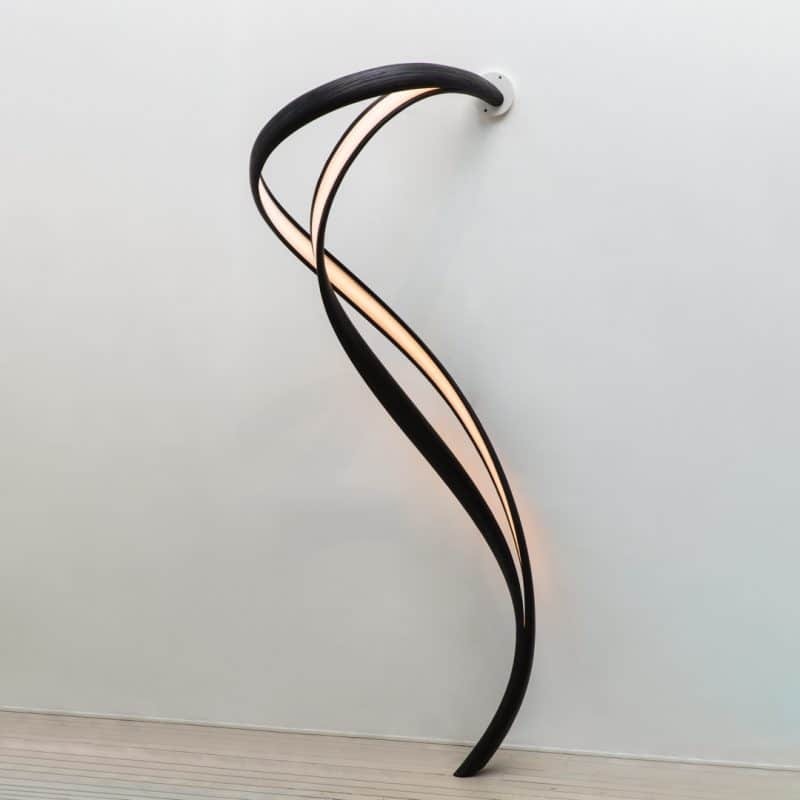 The serpentine sculpture gracefully descends from its fixed point on the wall as the form splits into two inky ribbons exposing the internal LEDs. Procario has finished this unique work using the shou-sugi-ban method, an ancient Japanese finishing technique that preserves wood by charring it with fire. 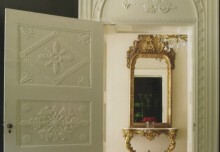 In addition to being aesthetically striking and elegant, this method of finishing enhances the durability of the wood. Further exploring how sculpture and traditional bronze casting methods can inform contemporary design, the gallery will showcase a monumental work by Alex Roskin. Roskin’s L’éléphant Console reflects modernist and primitive fine art influence. The console’s muscular sculpted shape is cast in bronze, and polished to a mirror finish. 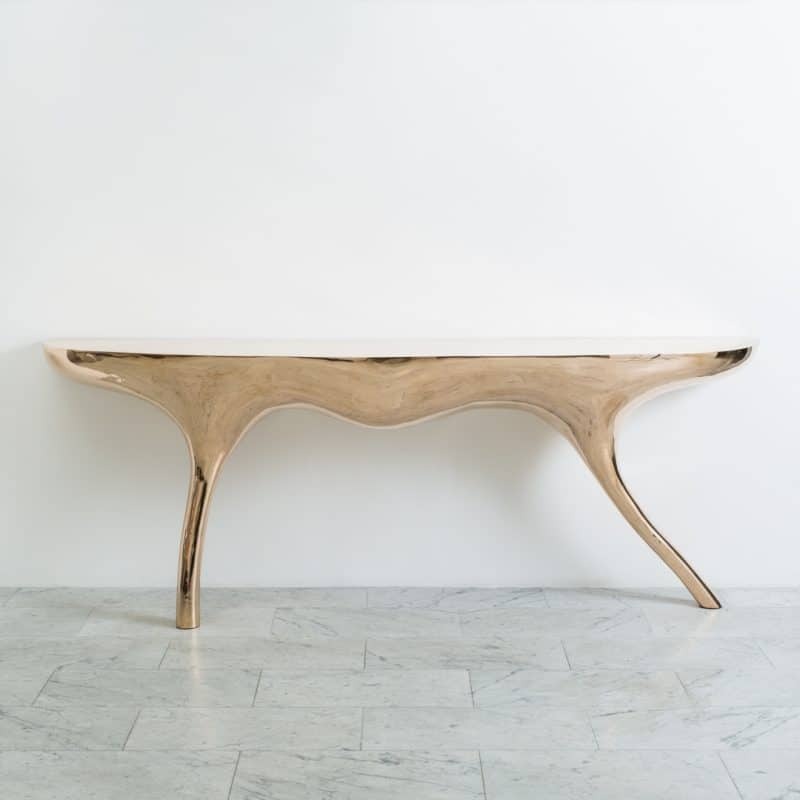 The base of the table, bowed and sinuous, fluidly extends to meet the floor. The console is designed to assume a rich patina as it ages. 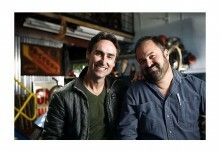 Each work on view showcases the high quality and innovative spirit that Todd Merrill Studio has come to represent. Defying categorization, the artists represented work in a space between fine art or design to present unique and collectible pieces that with timeless appeal.